Anger often makes us uncomfortable. It’s uncomfortable to witness and uncomfortable to feel. Witnessing your child’s anger can be especially uncomfortable. 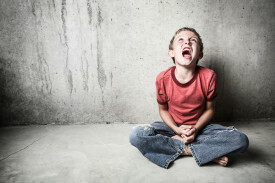 In order to relieve this feeling, parents will often encourage children to “stop crying” and say things like “it’s nothing to cry about.” It’s moments like these that plant the seeds of unhealthy anger. The “stop crying” parent is just doing what they were taught by their own parents, who were probably taught that by their parents, and on and on. While telling your child to “stop crying” isn’t emotional child abuse per se, your child may still need help with depression, addiction, or other issues later in life. This cycle can be stopped, however, if we learn how to create healthier anger in our kids, and in ourselves. To understand why stuffing emotions away is unhealthy, think of emotions like they are physical wounds. When you cut your finger, your body knows to tighten blood vessels and release white blood cells. In order to let your cut finger heal, you’ve got to let the body’s natural process work. Like the body, the psyche knows what needs to happen to heal emotional wounds. To let your mind heal, you’ve got to let yourself go through a healing process as well. If you don’t let yourself heal, whenever a similar event happens in your life, the old emotions will emerge and cause you pain. Until you learn to examine your feelings, retrieve their messages, and let them go, they’ll act like cuts that never close.